The current levels of political polarization and partisanship, which we are keenly aware of in the wake of the US Federal Government shutdown, get blamed on many factors, especially the bogeyman of new technology, the internet and social media. Political critic Dan Carlin makes the point in his most recent Common Sense podcast (“The Shutdown Sideshow” at about 8:30) that increased political polarization should be an expected consequence of increased gerrymandering. In gerrymandered voting districts engineered to effectively guarantee the victory of a particular party, the winner of the election is primarily determined by the party primary elections. The winner of the party primaries is determined by each party’s “base” voters. The inevitable result of such a system is the election of progressively more extreme politicians selected by gerrymandered districts, which effectively cut the majority of moderate voters out of the process. Responses to the activity of these politicians would then drive polarization among voters. Is Dan Carlin right on this one? I cannot say for certain, but after five minutes of thought, it seems like increased political polarization is the expected consequence of an increasingly gerrymandered system, with or without modern communication technology. The burden of proof, therefore, falls more heavily on those arguing that it is the result of some other factor (eg, internet) or that political polarization has not increased. This entry was posted in Follies of the Human Condition and tagged gerrymandering, Linkonomicon, Politics. Bookmark the permalink. Has gerrymandering increased? Is the evidence for that discussed in the podcast? It seems like there have been numerous efforts to decrease gerrymandering over the past decade or so. 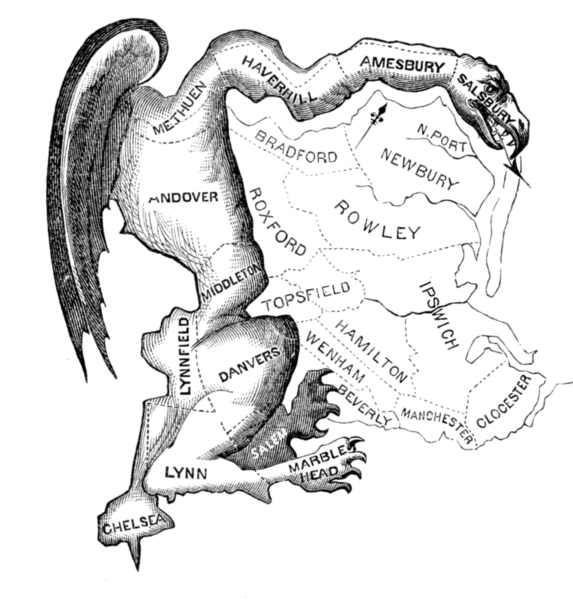 No evidence is presented for increased gerrymandering. There are a few issues to consider. First is that, even if the amount of gerrymandering remains constant, polarization will increase as the process of electing extreme politicians takes time. Second, gerrymandered districts have to change over time to keep up with population movements. Third, there is a question of the effectiveness of the gerrymander. While some locales have tried to curb gerrymandering, others (eg, Texas) have crafted incredibly effective gerrymandered districts. So, you are right, the underlying assumption is tough to prove, but no worse than those underlying other theories. The proposed influence of gerrymandering sounds totally plausible, whereas “blame the internet” sounds like the wild speculation of a media pundit who can’t see any further than his own nose. I have my own wild speculation for what may be going on, but the baseline question is whether this is anything exceptional. There were plenty of highly polarized periods in the history of the USA; after all, we did have a civil war. There were some tough times in the early republic… more recently, there was almost a coup against FDR, there was McCarythism, and some fanatical opposition to JFK (particularly in Texas). And then there was the 60s. In the long run, I’m not convinced that the current situation is exceptional… this variation is inherent in politics and it is driven by the complex interactions of a million different factors.